The book might not be what you're looking for if you're after a serious Lord of the Rings style quest, but if you enjoy parody and humour, especially of the meta sort (maybe comparable with Pratchett), Promises, Promises delivers and is worth a read. The references to various well-known works are fun to spot, among them The Princess Bride, The Life of Brian, Narnia, Shrek and Lord of the Rings. Readers will also be able to spot plenty of self-referential humour that points out common fantasy tropes. But it's really the cast of characters that makes the story. First we're introduced to our protagonist Sandy, a young witch, her seemingly delusional friend Drusilla and her sensible neighbour Ruth. Sandy doesn't have much luck with women, Ruth supposedly doesn't stand out in any way, and Drusilla is, as she proclaims a number of times, a dispossessed princess of an oppressed people, in disguise and always armed with her trusty paring knife to fight off any assassins. (We don't actually see her fighting any, but she regales her travelling companions with tales of her encounters with these would-be assailants, despite the skeptical reactions she gets from her audience on the whole.) Once the quest Sandy brings upon herself is underway, a few other characters join the cast, adding to the main team's range of memorable personalities: Captain Tyrone and his shiny armour, Anax'athelia the Amazon (real name Mavis Green) and Bob the ogre. Tyrone is there to be anti-magic and ignorant, Mavis vocally pursues women's rights, and Bob isn't your average ogre. While the dialogue may feel a little forced at times, whenever the characters' remarks lampshade tropes, it doesn't detract from the humour, and the characters themselves are enjoyable to follow throughout the story, bouncing off each other well in different ways. Even Tyrone has a place. Sandy and Ruth are the more ordinary members of the group, and possibly also the ones easiest to relate to, but almost the entire cast is perhaps surprisingly endearing. The plot isn't elaborate -- there's a princess and an important, not unrelated quest -- and its execution can feel linear as well as slightly disjointed, and maybe lacking in fighting action, if a quest is expected to involve epic battles. This quest is basically a list of items that need to be found and each item is addressed one after the other, with some minor stops and detours along the way, in a series of brief random encounters. However, I got the impression that the convenience was deliberately done for humour's sake, especially with certain scene transitions, and it works. In a similar vein, the Happily Ever After ending doesn't really come as a surprise and it might seem too easy, but the sweetness and wit that it includes make it a perfect ending for this book. L-J Baker is clearly a skillful writer, creating interesting characters and clever stories. I'm personally rather partial to the sort of humour Promises, Promises uses, and I found Ruth charming and Drusilla hard to put down, which may mean that I'm biased, but, as objectively as possible, I would recommend this book and the author's other works for the characters, in particular. 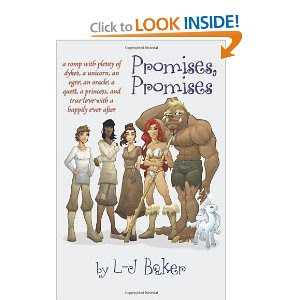 You can buy Promises, Promises on Amazon as a paperback ($15.00) or Kindle eBook ($6.99).